By Therese Stecyk Posted: January 10, 2019 10:15 a.m.
It’s not every day that a new PhD program is launched. A new interdisciplinary PhD in Media and Artistic Research in the Faculty of Media, Art, and Performance (MAP) marks a significant milestone in developing, advancing, and promoting research creation and Indigenous scholarship through the arts. “Historically speaking the arts and crafts were not part of the academic environment, and until two or three decades ago, weren’t necessarily seen as something that advanced knowledge or had traditional research methodologies,” says Kathleen Irwin, MAP associate dean of research and graduate studies, and a key driver behind the newest academic program at the University of Regina. That attitude started to change at the turn of 20th century when artists, rather than just being skilled craftspeople, became individuals who “critiqued society,” says Irwin. 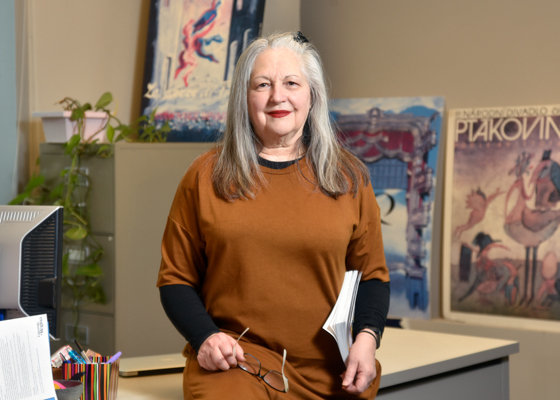 The University’s new multidisciplinary PhD in Media and Artistic Research recognizes that research creation exhibits intellectual rigour while bringing new perspectives by combining critical reflection and the making of artwork, says Irwin. The innovation in the new PhD is that it recognizes “research in the arts” in which the artistic practice itself is an essential component of both the research process and the research results, and sees this as equal to any other form of critical thinking. “Research in the arts is truly innovative. It recognizes that the actual making of something, the investigation that goes on around it and how it’s disseminated, can be recognized as creating new knowledge,” explains Irwin. Irwin points out that the thoroughness already established through existing academic systems – supervisors, committees, external reviewer – won’t change. The new program is simply providing a way forward – opening the doors to new methodological approaches. Although the new program will appeal to a unique niche of potential scholars, it’s also vitally relevant to the Truth and Reconciliation Commission calls to action. “It recognizes and embraces non-traditional approaches to look at research through the lens of other cultures and their methodologies. Here in Canada, for example, there is a growing awareness that new knowledge can be found within a non-European model,” she says. The new PhD aligns with several other Indigenization initiatives under way in the Faculty of Media, Arts, and Performance including a new hire in Indigenous art practice. For Irwin, the value of the new program to society is clear: that there are many ways to understand the world around us and to create new knowledge. “Many cultures have diverse ways of getting to new knowledge and exploring the world around them. And it’s time that we opened up the doors to it,” she says.